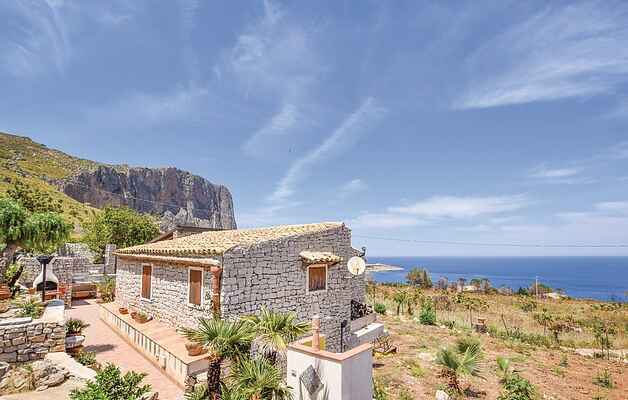 Beautiful holiday home by the sea, just 4 km from San Vito lo Capo in Sicily, in an area of unspoiled nature and rich in Mediterranean vegetation. From the house you have a beautiful panorama view of the sea and the rocks. The accommodation is on the ground floor and consists of a living / dining room with double sofa bed, double bedroom, bedroom with two single beds and a bathroom with shower. Ideal for a beach holiday with the family. With access to a partial covered terrace equipped with tables, chairs and barbecue, here you can eat outside and enjoy the beautiful scenery. The children can play outside, they can find a slide and a swing. There is parking on the property. Some distances: San Vito lo Capo (4 km) with shops, equipped beaches, surf and sail rental, Erice (45 km) with its Castello di Venere and the cathedral, Trapani (55 km) with the Museum of the Saline and the Palazzo Senatorio. Do not miss a trip to the Zingaro Nature Reserve (6 km), where you will find a wonderfully isolated area, with no roads and houses, and a beautiful unspoilt section of the sea, in contrast to the vegetation.